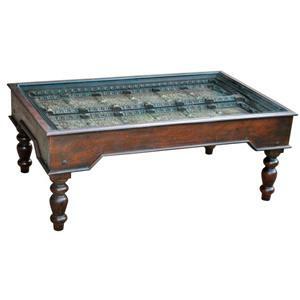 Impress family, friends, and guests with this delightfully vintage Old Door coffee table. 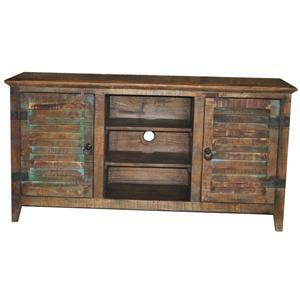 Created from solid reclaimed wood, this piece carries a sophisticated, historical feel in it's stately traditional style. Turned legs and an "Old Door" table surface add the elegant details that will characterize your home with charming style. 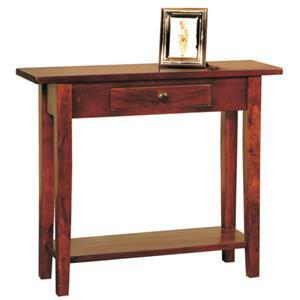 This lovely classic sofa table will be a great addition to your living room or entry way. It features crisp straight lines and a warm brown finish. The table includes a bottom shelf and a wide top surface for decorative pieces. A convenient drawer gives you a place to hide household accessories as well. 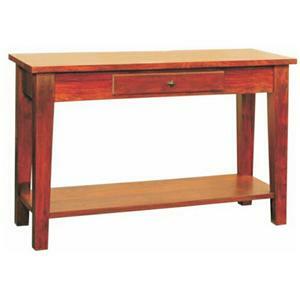 Furnish your home with this lovely entry table. Utilize this versatile media unit in your living room or master bedroom for all of your entertainment needs. The 64" width can easily hold a widescreen TV with two doors and two shelves with wire management for storing DVD's, electronics, and media components. 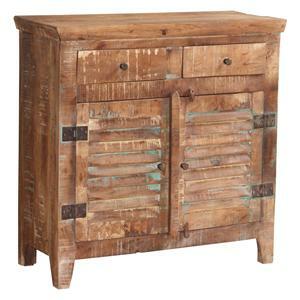 The vintage design is crafted from solid reclaimed wood with distressed painted accents over the shutter door fronts. Metal hinges, ring pulls, and tapered feet complete the rustic look. Spice up your home with this hand designed entertainment center. Accent door fronts featuring subtle coloring and hand carved patterns beautifully enhance the warm brown finish of this piece. Large swinging round door pulls add to the centuries old pattern design brought down through generations of skilled artisans. Two center shelves and two side compartments can easily store your media components, electronics, and movie collections for easy access. 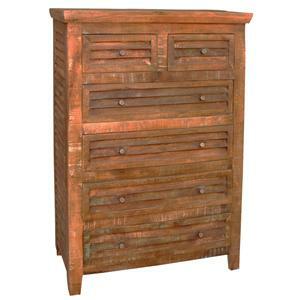 Enjoy plenty of clothing storage space in your bedroom with this chest of six drawers. Case sides and drawer fronts feature a shutter design with brass-colored round knobs.Crafted from solid reclaimed wood with a unique weathered finish for a vintage style. 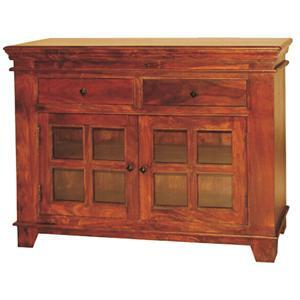 Accent your home furniture collection with this incredible dining sideboard. Featuring centuries old patterns hand carved into the front and paneled doors, this piece is a beautiful blend of vintage and traditional style. Large swinging round door pulls, and drawer bail handles accent the rich brown finish and distressed coloring door fronts for a captivating color palette. Spice up your dining area with this charming dining sideboard. Featuring two drawers and two doors with interior storage space, this cabinet allows for easy organizing of silverware, dishware, and room decor. Glass paneled door fronts and simple geometric knob hardware brings a unique touch to the transitional style. Crafted from solid Sheesham wood in a warm brown finish, this piece beautifully displays natural wood graining for a warm, wholesome look. 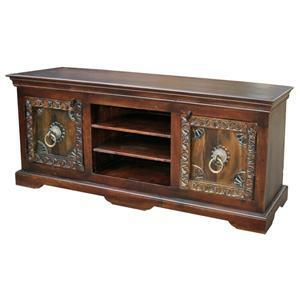 This lovely classic entry table will be a great addition to your living room or entry way. It features crisp straight lines and a warm brown finish. The table includes a bottom shelf and a wide top surface for decorative pieces. A convenient drawer gives you a place to hide household accessories as well. Furnish your home with this lovely entry table. Enjoy unique style in your master bedroom with this beautiful shutter bed. 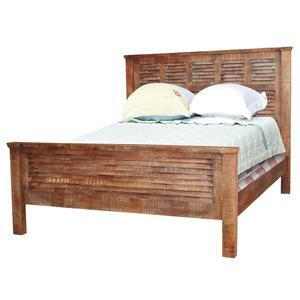 Crafted from solid wood with a tall panel headboard and footboard to add height and depth to any room. Finished in a simple design with a weathered finish for an old fashioned touch. This bed is available in Queen and King sizes. 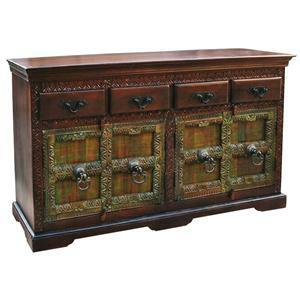 Make a unique statement in your dining space with this old world sideboard. Newly crafted from sturdy old reclaimed wood, this piece features distressing and hand painted accents for an authentic time-worn look and feel. Two large doors and two drawers with metal pull knobs feature shutter fronts and ample interior storage space for kitchenware. Jaipur Furniture welcomes you to our latest collections of stylish, handcrafted. If you are at all familiar with Jaipur Furniture, then you, of course, know that photos cannot do justice to the beauty, quality and handcraftsmanship inherent in our pieces. The weight, the scale, the sturdiness, the hand of each piece attests to the fact that behind each offering from Jaipur home is a passionate craftsman. If you are searching for the best handmade furniture in the industry, you need look no further. While we hope you enjoy our products gallery, we are certain that you will appreciate our furniture even more first-hand. We’ll also venture that your children and grandchildren will, one day, enjoy the timeless sophistication of your Jaipur Furniture Limited as much as you do. Our Passion is what best captures our fascination and obsession with innovative, High-Quality Solid Wood Furniture.